Is the labor market headed for a fresh round of trouble? 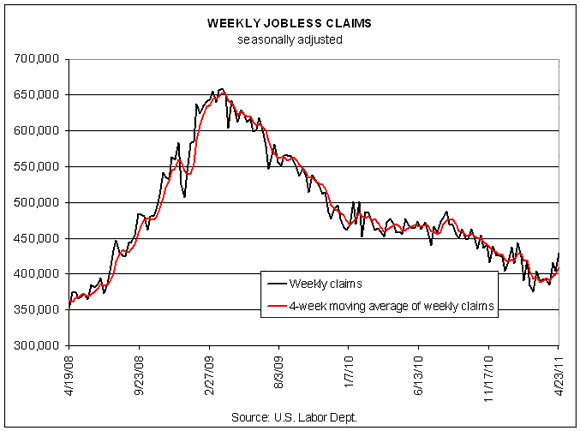 Today’s weekly jobless claims report provides some new motivation for going over to the dark side on this question. The usual caveat applies, of course: divining the future from any one number in this volatile series can be misleading. Unfortunately, the jump in new filings for unemployment benefits is no longer an isolated data point. A chart of recent history tells the story. New filings jumped to a seasonally adjusted 429,000 last week—the highest since January. More worrisome is the recent rise in the four-week moving average for weekly claims, a trend that increased to more than 408,000 last week. Save for one week earlier this month, the four-week average has risen continually since this measure bottomed out in early March at just under 389,000. And while we’re reviewing distressing signals in this corner, let’s note too that the four-week average is now above the 400,000 mark for the first time since February. Is it all just noise? Possibly. Much depends on whether there’s corroborating evidence from other corners of the economy, starting with the next report on nonfarm payrolls, which is scheduled for release next week (Friday, May 6). The last report revealed a fairly strong number: private job creation advanced by a net 230,000 in March. That’s hardly a cure-all for the various ills that afflict the U.S., but it’s far too strong to inspire writing the epitaph for the current recovery. Even with the concerns embedded in the latest jobless claims report, it still requires an especially negative interpretation of the vast majority of economic reports to argue that the labor market is set to crumble. But the rough rule of thumb that jobless claims under 400,000 imply continued expansion in the all-important labor will weigh heavily on sentiment until (or if?) a fresh batch of numbers re-boost confidence. Nonetheless, the bigger risk for now is that the economy’s rebound moderates rather than evaporates. In fact, that’s been the concern all along. There’s still forward momentum in the broad trend, but it’s not as potent or persistent as some have argued. And with various corners of the economy still firmly on the defensive, starting with the residential real estate market, there’s little reason to assume that we’re set to grow out of our troubles any time soon. In short, the real danger is less about a new recession than coming to terms with an economy that struggles (still) to grow.